Yūji Honbori, a trained sculptor, has always been interested in using discarded materials. In 2004 he began experimenting with cardboard boxes from his local grocery store and became fascinated with the delicate, see-through quality of cardboard as viewed through the corrugation. He realized that this could suggest Buddhist notions of impermanence and ephemerality. 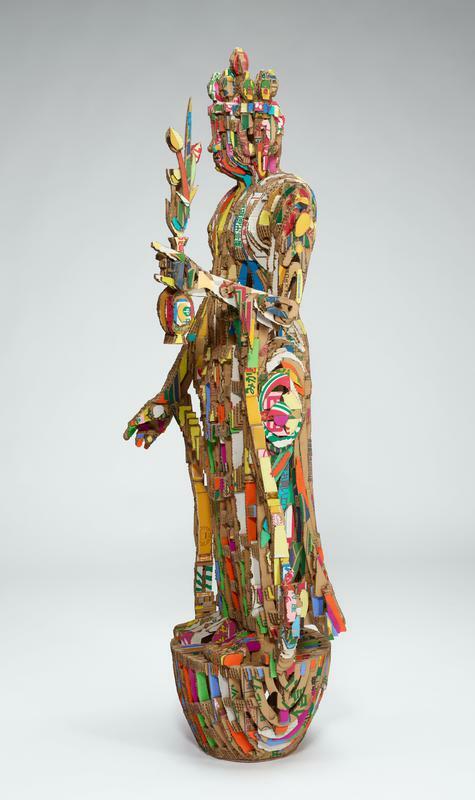 For the last few years, he has been producing life-size works in cardboard based on famous old sculptures found at Japanese Buddhist temples. This sculpture depicts Eleven-headed Avalokiteshvara, an important bodhisattva in the Esoteric schools of Buddhism, that has 11 heads atop its own—10 bodhisattvas and one buddha that represent the 10 stages of enlightenment preceding eventual buddhahood. It is based on a well-known sculpture made in the 700s, now owned by the temple Shōrinji.